Rani Kot Fort, Dadu is part of the Tentative list of Pakistan in order to qualify for inclusion in the World Heritage List. The rusty hand painted sign at the turning was intriguing - “Sindh Culture and Tourism Department. WORLD’S BIGEST FORT RANI KOT. 2500 Labours had prepared FORT RANI KOT 22 miles during 3-4 years about (before) 325 BC. NOT ACCURATE” (sic). Then, what is called “The Great Wall of Sindh”, comes into view snaking its way across the hills in a way certainly very reminiscent of the classic photos of the Great Wall of China. The road continues through a gap in the wall where a river bed passes – this is the Sann Gate, one of 3 through the wall situated at the W/S and E cardinal points. 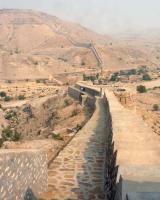 Rani Kot’s claim to be the world’s “biggest fort” relates to this wall which extends to some 30kms in an approximate rectangular shape, the northern side of which is a steep cliff which doesn’t actually need a “wall”. But why? There is no evidence of there having been anything much within the walls which required a fortification of this size. Which takes us back to that sign at the main road and its “(before) 325BC”. In fact the earliest record of the walls dates back only to 1812. In some form the wall certainly predates this, but, by how much is a mystery. As stated on the sign 325BC does however seem to be excessively early and not likely to be accurate! But we had reached as far as we could go. The metalled road continued for another kilometre inside the walls and then reached a part-completed concrete bridge. There was no alternative for our saloon car – a 4x4 could probably have progressed by following the river rather than the road but we had to make do with the walls at the main entrance. A few kms further in there is apparently a small ruined fort, or at least a residence for the Mirs who ruled the area from the mid 18th Century. In true “Great Wall” style we climbed the walls on both sides of the entrance and took in the views. Examination of the walls close up confirmed the impression from a distance – this part of the wall had undergone considerable recent reconstruction as shown by the new cement and a number of features such as archways in locations and to designs which didn’t really seem authentic. I have since discovered that the renovation work was stopped and that an investigation is underway as to how such poor renovation work could have been allowed - http://dawn.com/news/218351/restoration-work-in-ranikot-stopped . So what of Rani Kot’s chances? It has in fact been rejected once already – back in 1984 under the title of “Rani Kot Fort (Kirthar NP)” with the statement that “The Bureau, while taking account of the great importance of this site for the Pakistani national heritage, felt that it did not meet the criteria of OUV as understood by the Committee”. For some reason Pakistan reintroduced the site in its 1993 T List and, as per the report in Dawn above, obviously still harbours ambitions for it. We enjoyed our visit and the view of the walls is quite impressive but I can’t see a WHC reaching a different conclusion in future. I visited this site on 26th December 2009.This site is 270 kilometres north from provincial capital Karachi.A metalled road leads one to site in prefereably 4*4 vehicle,although 4*2 may also suffice.It seems to have recently been repaired.It is no doubt a testimony to great human effort.The fortress inside is similar in design to that of Kotdigi fort.It was realy a special day for me.There are no entry fees.Food should be taken along as there is asmall tea-serving `Gabol Hotel' near the fortress.There are about 40 houses of Gabol community who do farming in the bed of nearby rainwater channel. The fort is so widespread that it can not be seen in one or two days.Its history needs to be checked as it has been written on a board at the Sann-Raneekot turning point that the fort was constructed in or about 325BC. It is not only a place of historical value but a very scenic also.The high mountains,the greenary by cropping and the thought as to how would this fort have been built hundreds of years ago when there was no machinery makes it a monument of great human contribution to this world. I consider the fort to have been constructed by some technologically advanced people of unknown past.I do not understand why it has not yet been declared a World Heritage Site.I would strongly recmmend its declaration as world heritage.